This post is actually excerpts from an essay that I wrote for my World Religions class. It’s about how faith is built through the trials we face, and I hope it inspires you even in life’s most difficult challenges! We all know the phrase, “what doesn’t kill you makes you stronger.” How much do we really believe this? No one is ever asking for tough times to happen so they can become stronger or learn to have better faith. Sometimes we think that faith grows tremendously only in the good times. In Genesis 22, God asked Abraham to offer up his son Isaac as a sacrifice. This can be seen as a very negative request. Why would God do something so cruel? Why did Abraham not turn his back on God? After all, God did ask Abraham to do something very difficult: give up what he loved most in order to test his faith. The reason God did this is because life’s challenges can make us stronger and increase our faith. Abraham and Sarah wanted a child for most of their lives. Abraham needed an heir for his inheritance, so it would only make sense how much he appreciated the gift of his son Isaac in his old age. Again, this only makes God seem crueler in His asking Abraham to kill his son. Only Abraham did not see God this way. As he was leaving with his son he said to his men, “‘stay here with the donkey; the lad and I will go yonder and worship, and we will come back to you’” (Genesis 22:5 NKJV). This shows that Abraham had the confidence that his son would be spared. Why would a man who was just told by God to kill his beloved son be so confident that everything would be okay? He did not protest or seem to get upset at God—Abraham simply complied with God’s command. This proves that he had faith. Abraham knew that God would keep His promises to him. He knew that if he trusted God, then everything would be okay. Although he did not know how it would work out exactly, Abraham had the hope that God would come through. When his son Isaac asked Abraham where the burnt offering was to sacrifice, Abraham said, “’my son, God will provide for Himself the lamb for a burnt offering’” (Genesis 22:8 NKJV). He had faith that God would provide the offering and spare his son. Maybe he did not know exactly how it would end, but Abraham decided to have courage and go through his trial. In the end, everything did work out just fine. Right when Abraham was about to kill Isaac, God stopped him and sent a ram to be the sacrifice instead. Abraham’s faith was tested, and he passed. The Bible says that everyone is granted with a measure of faith (Romans 12:3), and that measure of faith can be seen everyday! We have faith when we get up in the morning that our car will start so we can go to class or work. We have faith that when we call a friend or loved one that they will be alive and well to answer. 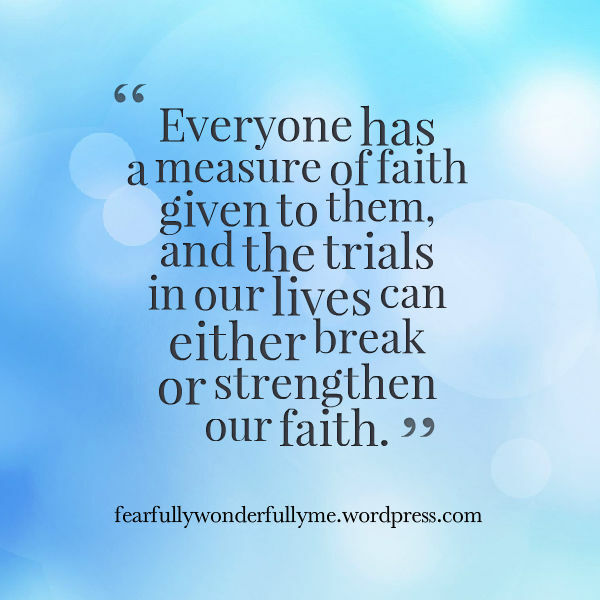 Everyone has a measure of faith given to them, and the trials in our lives can either break or strengthen our faith. Abraham’s test could have broken him and turn him away from God, but instead he used it as an opportunity to strengthen his faith. We all have that basic measure of faith, but making it through difficulties is what truly builds our faith. With Abraham, God wanted to see if he had enough faith in Him for future hardships. If Abraham could not trust God through the trial with his son, then he could not trust God through other difficulties such as loss, sickness, or other disaster. 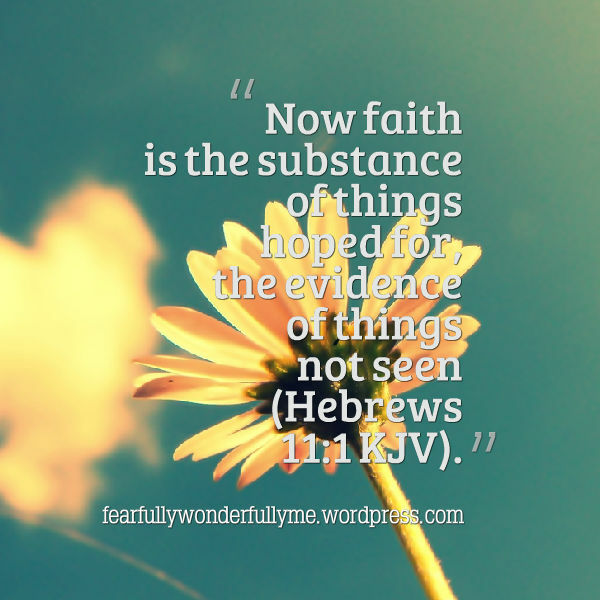 Once Abraham saw that God came through and stopped him from killing his son, he knew that he could have faith that God would bring him through any other circumstance. I faced a great hardship last year when my grandpa died. He fell down the stairs and suffered a massive stroke. It took him five days to die, and I was there to help him pass on. My grandma is very sickly, and now my mother and I are responsible for taking care of her. This was a season I never thought I would get through. If I did not have faith in God and that everything would get better in time, I would have broken down completely. At first, I could not understand why God would throw these hardships my way. I almost felt abandoned—much like Abraham probably did when he held that knife above his son. But I knew I had to have faith. Looking back, I can see God’s hand throughout this part of my life. Not only did He bring me through it, but He also made me stronger, compassionate, and more mature. God used that challenge to build me up for the future and to increase my faith in Him. I now know that when other, possibly greater, challenges come my way that God will remain faithful. I know that I will get through anything that comes my way with faith in Jesus Christ. I know that the victory that comes from having great faith is always worth it in the end.